Above, with the .45 and 7x50s is Father at age 26. 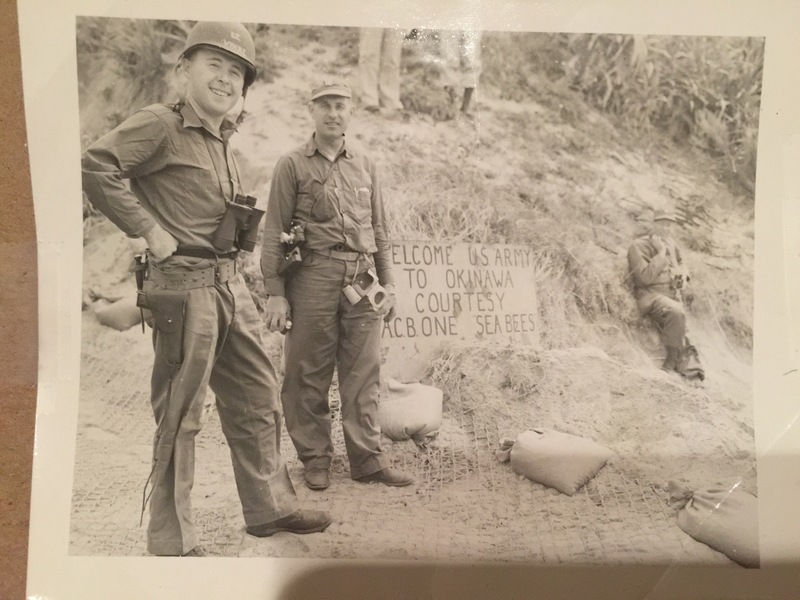 The sign reads “Welcome US Army to Okinawa Courtesy of ACB (Amphibious Construction Battalion) ONE Seabees”. This was during the Korean war, not WWII. To prepare for landings in the Korean war, US forces practiced on Okinawa, which most people forget is only 600 miles from Korea. It was a close location under US control that offered some secrecy. In amphibious invasions of that era, some of the first people ashore were Seabees. They developed ‘welcome’ signs to remind everyone they were out front. This wasn’t just true in Pacific battles, Seabees were places at Anzio and D-Day. In the picture above, Dad is a Lt.jg, commander of ‘Dog’ company of ACB-ONE. This was one of the lighter moments before heading north to Korea. When an LST headed to the beach, the first vehicle down the ramp was usually a bulldozer run by a Seabee. It went out ahead because it was far less prone to getting stuck than a tank. The moment the doors open and the ramp drops, the vehicles poured out as fast as possible. Because landings were typically made at 4am, the Navy wisely chose to have Japanese harbor pilots, who knew the waters, on the LST’s for the practice landings at Okinawa. These men had been officers in the Imperial Japanese Navy, fighting the US just 6 years earlier. On the very first landing, my father stood above the well deck with a bull horn, directing the vehicles the last minute to the beach. Beside him was a former Japanese Navy officer, observing. Everything looked perfect right up to the moment the Seabee bull dozer moved forward. It accidently hooked the blade on the door frame, and jammed on the ramp. The tank behind it lurched forward and hit the bulldozer, preventing it from backing up and freeing itself, In the dark, bathed in noise, no one behind could tell what was happening. Pandemonium broke out with Seabees and Marines shouting at each other and nothing headed down the ramp. A general altercation ensued. Dad, powerless, watched a perfectly choreographed maneuver fall apart. He noticed the Japanese officer standing next to him staring incredulously. Evidently he had a very hard time rationalizing how his nation has just lost a war to clowns like these. I want to say thank you to all the people who took a moment to share a thought or a prayer for Dad. He is actually doing much better this week, and we are working to bring him home in the next week. It is my genuine wish that everyone understands that speaking of my father is just a specific appreciation for my great general respect for men of his generation, and what we all received from them. Dad would be the first person to correct anyone who even suggested that he was someone special. He is most comfortable when people identify him as simple participant in events that mattered. I trust that many of you who’s fathers had similar experiences had that same perspective in your own homes. Whenever someone wants to speak of admirable men in front of my father, he will always turn the conversation to his own father, who lived from 1891-1960. Perhaps most fortunate men look upon their own fathers with a profound sense of gratitude. I do. I am staying in NJ until Dad is back home, and then I am headed to my hangar in Florida for a few weeks to build back up the inventory of parts on the shelf. After that, I am flying back to California to resume the last legs of the Western Tour. The goal is to return to Florida and have a solid month to work before heading to Oshkosh. I have been out of the shop a long time, but keep in mind that the Weseman’s take care of the distribution of our catalog parts now (Outlook 2016, New order page and distribution method. ) so anything ordered doesn’t have to wait for me to be in Florida to get it on it’s way to your shop. 6 Responses to USN sea story. This will be the rare circumstance where I disagree with your father. He IS a very special person. I’m a richer man for having met him and for having gotten to know him a bit, minor through your stories and writings. Thank you both. I’m delighted to hear he is better. My thoughts and prayers to you and your family. I’m glad that your father is feeling a bit better. Your thoughts and stories of your father and his service to this great country humble me. My father served as well, and never talked much about specifics. Regardless, I am still very proud of him and his sacrifices to preserve this country. Unfortunately, my dad was lost to cancer and never had the chance to share many of his thoughts regarding his service. I have been following you and your stories of your fathers service for nigh on ten years now and enjoy your stories very much. “Dedicated Hero”, like it or not, is a title he has earned. Many thanks to him for his service, and to you for sharing both his thoughts and yours. We may well build engines and airplanes as a vocation while clearly there are much bigger animating principles behind the effort. Being 53 and still having your Dad is a gift. That your Dad shines the light elsewhere shows the path for us all. All the best…………. William, Continued good wishes for your father and family’s comfort in these trying times. Your priorities are in the right place! God’s grace be on you and yours. Hi William Im glad to hear your Dad is better. We all owe him and all the heros of his generation gratitude and thanks for keeping us free. Very good news… talk to him a lot! I can relate with you… only my dad passed away a few years ago! He was in the services WWII(Canadian Army) in France. Never did like to talk about the war… I tried many times to get him to talk, but he just shut right down! Again this is very good news. I really enjoy reading your posts… having only started receiving them recently, I have missed a lot over the years!!! !